Here's a new report file you might like to add to your Scense Report Viewer. It shows the application users grouped per application, so you will know which unique users are using a specific application. By default, the functionality for adding and removing reports to and from the database is disabled to protect the reports in the database. This functionality can be switched on by adding a value in the registry. The procedure above has imported the report into the Scense database so it will be available for everyone using the Scense Report Viewer. The new report can be found in the Scense Report Viewers tree-view and is named: “Application Users (unique, grouped)”. During the install of Scense quite some settings are generated, like new accounts and data shares. As some of these setting ensure a trouble-free usage and simple deployment, these settings might not always fit the company security best practice. Some quite simple changes in the configuration can solve this. As it is in best interest for all to have stable installations, that are also secure I have decided to share the guideline with the community. You will find these as an PDF attachment on this post. 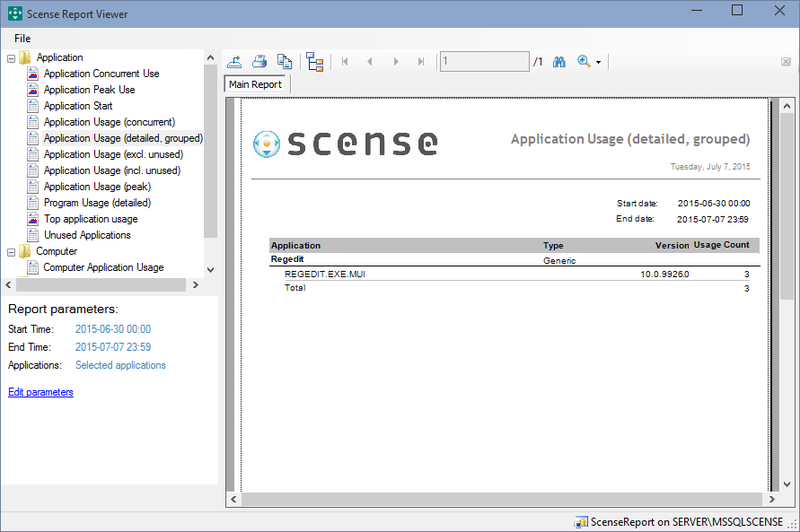 Scense 10 lets you monitor the usage of applications. But what if you want to monitor applications that are not delivered by Scense? By simply checking the box that says 'Enable metering for this Application' you can tell the Scense application monitor service to start monitoring the usage of the application. This works for all applications you are delivering with Scense, but it also works for applications you're not delivering with Scense. In this fictional scenario we would like to monitor the usage of the Windows Registry Editor (regedit.exe). Regedit is not delivered by Scense as it is part of the operating system. 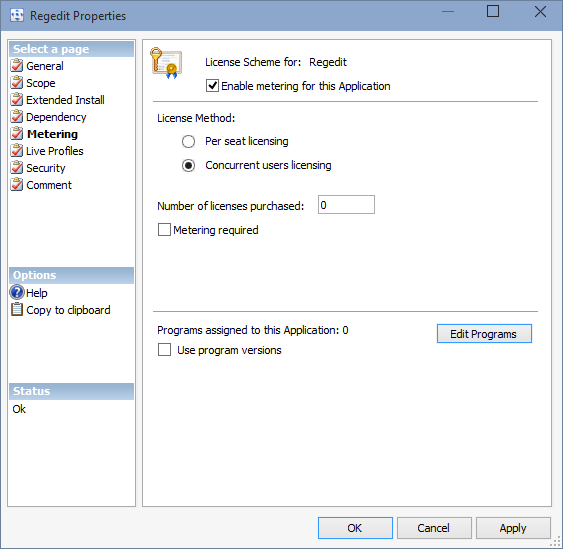 In Scense there's no application object for Regedit, so we can't enable software metering for it. This is very easily solved by simply adding a new Generic Application Object for Regedit. After creating the generic application we should remove the embedded Taskset because we don't want any runtime activity for this application object. This leaves us with an empty Application shell that we can use to enable software metering. 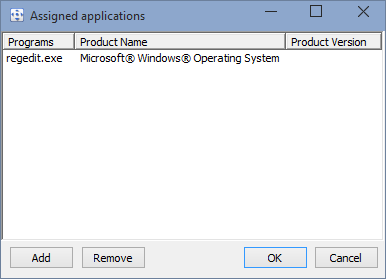 It's probably a good idea to move this application object to a dedicated folder for application objects that are created with the sole purpose of enabling software metering (applications not delivered by Scense). Now that we have the application object for Regedit we can start configuring it. We should ignore all other pages and only configure the Metering page. First we need to enable metering and specify some details about the usage context of the application. Next, we tell software metering what program it should monitor. We do this by clicking the 'Edit Programs' button, click Add, browse to the regedit.exe program and select it. After clicking OK several times, the Scense software metering system will pick up on this new application and start monitoring it. This can take up to 30 minutes by default. If you want to speed up things you can restart the Scense Application Metering Service. Each usage of regedit.exe will be stored and prepared for reporting and after a while you will see the registry editor appear in your report viewer. This post originally appeared on the ScenseGuru blog. As of Scense 10 the installers (msi) for the Scense Client and the Scense Update Service support a new public property called 'SVCSTART'. This property controls the automatic starting of the installed services. Sometimes during a Scense Client upgrade the Scense Update Manager would indicate that the new Scense Client was successfully installed on a workstation where in reality it was not. This behavior was typically caused by the inability to start the Scense OnDemand service because of a logon failure, where after the installation was rolled back. With Scense 10, and thanks to the new SVCSTART property, the starting of the Scense OnDemand service is now separated from the actual installation making it much easier to troubleshoot, because the Scense Client software remains installed. In unattended workstation scenarios it can be undesired that the Scense Update Service or the Scense OnDemand Service is started after it is being installed, because these installations are part of a larger unattended installation procedure which should not be disturbed by any actions the Scense services would invoke. The services are still configured to start at computer startup, so there's no necessity for additional configuration. Everything will be as expected after a reboot. SVCSTART=0 will leave the installed service in the stopped state. SVCSTART=1 will start the service as part of the installation (Default). When you are about to upgrade to Scense 10 and you are already using Scense Live Profiles for roaming application settings, then please read the following carefully. Scense 10 has a modernized 'process-to-application-mapping' (or PAM) that is shared between Live Profiles and the Software Metering subsystem. Any existing mappings in the 'old' filter sets should be upgraded to the new PAM before the Scense Live Profiles Client is upgraded on the workstations and before any changes to Live Profiles settings are made with Scense Explorer. The upgrade can be done with the attached tool. The upgrade tool will first check if there are already new PAM records in the database. If so the tool will assume that the upgrade has already taken place. If not, the tool will enable the 'upgrade' button which will, after being clicked, convert the existing mappings to the new PAM. The tool (Scense_SLP10.exe) must be run on a computer where Scense Explorer 10 is installed.